This text may not be re-published, printed or copied without the author's permission. The recent joint proposal from the Swedish Research Council and The Association of Swedish Higher Education about establishing a committee on scientific misconduct, which would investigate suspected scientific fraud in Sweden, is very important. For too long, academes have had all the possibilities to pretend to examine a suspect case, and then cover it all up in silence. The handling of the so-called Rylander affair illustrates the necessity of new legislation. Under the current system, universities and scientific institutions can investigate themselves, and there exists no possibility for an impartial appeal. This means that cronyism and collegiality, as well as the fear among headmasters of giving their institutions a bad reputation, play important roles in the assessment of alleged irregularities. I would like to account for a striking example, where a Swedish scientist's achievements in a trial in Switzerland have been found to constitute ”a scientific fraud without precedent” (a verdict in Geneva 2003), and where the scientist's Swedish home university was informed about the case in detail, but nevertheless chose not to execute any investigation worth the name. Neither has the Swedish Research Council been able to act; at present the council can only scrutinize scientific research which it has financed itself. The reader may remember the case of professor Ragnar Rylander, the tobacco scientist who for more than 30 years secretly was perhaps the most well-paid consultant of the tobacco industry? Starting in 1972 Rylander also had a central position at INBIFO (”Institut für Biologische Forschung”, The Institute for Biological Research) in Cologne, a laboratory owned by PM. In the 1990's, the institute became extremely important in keeping documents away from the American tobacco trials. Rylander had a key role when it came to approving and sending invoices between PM's European branch and the American, following a special scheme intended to fool the American prosecutors. 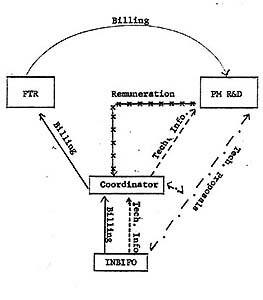 This formerly classified document from Philip Morris shows a "coordinator", who sits at the center, distributing invoices and technical documentation between the secretly PM owned institute INBIFO in Cologne, PM's R & D department in the US, and FTR (a PM subsidiary in Switzerland). The coordinator was Rylander; this is evident from several other documents. During the 1980's INBIFO scientists wrote around 800 reports, showing how harmful passive smoking is, but these were kept confidential. This is per se against certain ethics rules, which stipulate that a scientist must share his or her findings with the global scientific community. At that time, Rylander was also appointed as scientific advisor to the Swedish National Board of Health and Welfare, and he also had other public health assignments in Sweden and for the WHO. A key strategy for the industry is to ”create doubt” about the harmful effects of smoking. Those days when it was still possible to bluntly deny all risks are since long gone. This is a field where Rylander has been invaluable to the industry, for example when he acted as ”independent” scientist in 1990 and commented on a report from the American Environmental Protection Agency (EPA) about passive smoking. If the advice to a mother with a child with upper respiratory infections, is to stop smoking instead of the recommendation to feed the child a better diet, the public health effort will fail, wrote Rylander in close cooperation with Tom Osdene at PM. What interests the industry here, is to be able to introduce bad dietary habits as a more prominent cause for lung disease then passive smoking. In 1983 PM financed a symposium about passive smoking with approximately 80 000 dollars. For that money, the tobacco company primarily got one sentence, which Rylander wrote in a report. This sentence was quoted in ads in several hundred newspapers in the USA: ”An overall evaluation based upon available scientific data leads to the conclusion that an increased risk for non-smokers from ETS [environmental tobacco smoke] exposure has not been established.” Vague? Sure, but worth gold to the industry, which tried to ”create doubt” about the risks. The fact that a couple of hundred scientific articles by Ragnar Rylander state Gothenburg as his academic home – and still are the basis for other scientists' research, since they are included in medical databases – ought to be a problem for Gothenburg University. The University of Geneva has taken the question of Rylander's ties to the industry very seriously; three investigations have been made, which resulted in an exceptional measure: the university issued a general warning to the global scientific community and questioned the validity of the body of Rylander's research work concerning tobacco. The investigators in Geneva regarded the case as so grave, that they even wrote directly to the University of Gothenburg. Gothenburg claims to have performed an investigation about Rylander. But one can hardly refer to the report, which a workgroup within the “Council for collaboration standards” presented on December 6, 2004 – eleven days after the reception of the 26 page long correspondence from Geneva – as being an investigation. The Geneva letter is not mentioned with one word. Instead, it is said in this ”investigation” that one has “found no reason to assess the degree of truth” in certain allegations about a professor, whose name is not mentioned. There are documents that imply that Rylander has used Gothenburg Universitiy as a cover in order to transfer money from PM to scientific projects in China. In one PM document it is said that the Chinese are reluctant to accept money directly from a tobacco company, but Rylander ”is more than willing to use himself and Gothenburg University as the study's sponsor, with the financial aid provided by Philip Morris.” Of course, this must be investigated. But who wants to and who can under present legislation? Certain documents imply that tobacco industry money has flown in obscure ways, for instance, between Gothenburg University and the Karolinska Institute (e.g. for a study concerning the so-called cytochrome P 450), or between the universities of Geneva and Gothenburg, or between those two universities and Rylander's private bank account in the USA. Many of Rylander's studies have been financed by the organizations CIAR (Center for Indoor Air Research) and Rauchen und Gesundheit (Smoking and Health), both covers for the tobacco industry. During the years 1991–93 alone, Rylander received 373,580 dollars from CIAR, apart from his usual, generous grants (60,000 dollars/year) and consultancies (90,000 dollars/year) from PM. Both CIAR and Rauchen und Gesundheit required full control of if and when a certain study was to be published. This defies international ethics rules. Apparently, Gothenburg University has for decades received not only overt support from the tobacco industry but also hidden financing through these cover organizations. Who can today investigate Rylander's undeclared ties? What about the content of the research then? There are indications that Rylander might have manipulated his research to make it suit the tobacco industry. This has, however, not been investigated, neither in Geneva nor in Gothenburg. One example is a study about children and respiratory infections, published in 2000, which Rylander received 75,000 dollars a year for during most of the 1990's. While working on this study, he wrote to PM: “After corrections in the data base, there is now no correlation between ETS exposure and the frequency of upper respiratory infections.” Several experts have considered this as a clear-cut case of manipulation. ”When it says 'No other factors were significantly related to risk' one might ask why fruit consumption and milk consumption became risk factors in the previous study.” It must be added that ”the previous study” was based on the same data. In plain language, what Gösta Axelsson worries about, is whether anybody will find the new study credible, when the same basic data now all of a sudden yield another conclusion. I also tried to get a few attachments to these e-mail messages in order to examine the work with this study more thoroughly, but Gothenburg university refused to hand them over. Then I appealed to both the Administrative court of appeal and the Supreme Administrative Court, to no avail. Unfortunately, the university representatives regard these documents as work notes, which they don't have to hand over. But this is absurd in a scientific context. Scientific journals nowadays stipulate that authors must guarantee that they have had full control over all stages of a study and its publication. Consequently, such an assurance cannot be scrutinized if one does not get access to earlier working materials. Ergo. The university does not want to investigate. The Swedish Research Council cannot. And as a journalist one can't get access to the necessary documents. This means that a case like this today almost entirely may avoid public scrutiny. This is why the proposal regarding a committee on scientific misconduct is so important. An academe shall not be able to sweep cases like this under the carpet, with no possibility of appeal. And anyone should have the right to file a complaint. These matters must not depend on what the press one particular day might find interesting enough to print in bold headlines. It is also important that research that has been carried out many decades ago can be examined. The fact that a scientist has retired and a long time has elapsed can influence the purely judicial aspect. However, I believe that it is the actual research itself that should be the primary focus of a committee on scientific misconduct. Scientists pass on, but their research results may remain for hundreds of years. So, it is vital that the scientific outcome be as reliable as possible. Note: The ”tsunami tapes” were backup tapes of e-mail correspondence to and from the Swedish governmental headquarters at Rosenbad in Stockholm, exchanged directly after the tsunami disaster in 2004. Journalists requested them, in order to investigate the government's actions or lack of actions after the disaster. Government officials claimed that the tapes had been erased. This was not the case, however, and they were later found. See, for instance, articles in English in The Local.